Every year the Faculty of Finance and Accoutning cooperates with the CFA Society Czech Republic and students have a unique chance to take part in the CFA Research Challlenge. We are proud that the MIFA students actively participate in the Challenge and every year they end up on the top three best places. Congratulations to the team and we are looking forward for the next year! 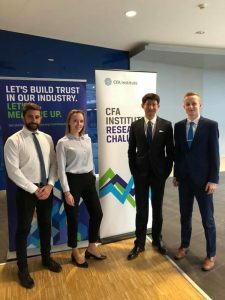 The CFA Institute Research Challenge is an annual, global competition that provides university students with hands-on mentoring and intensive training in financial analysis. Students work in teams to research and analyze a publicly traded company and then write a research report on their assigned company with a buy, sell, or hold recommendation. Each Research Challenge season leverages the efforts of over 140 CFA member societies, 3,500 member volunteers, and more than 5,000 students from over 1,000 universities.